The far end of the house was the Stable area. You can still see the old entrance within the stone walls. Imagine up to 10 horses lined up and resting at their hayracks all those years ago! 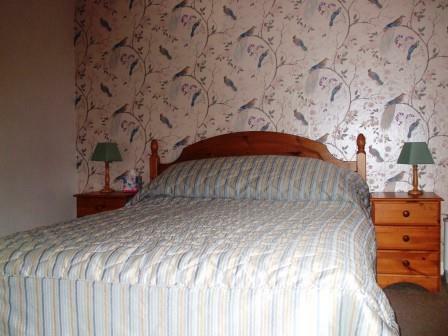 Now you will find a comfortable, wood-framed King-sized bed in this spacious, stylish room. 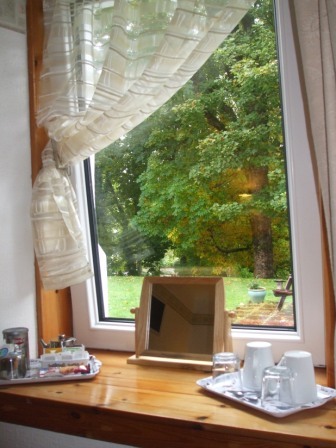 It is Centrally Heated, with a large window looking across the lawn to the trees beyond, and has tea and coffee-making facilities. This room also has a Wall-mounted SMART TV for all the TV and Radio channels you need, plus catch-up, Facebook, email and Youtube, all from the comfort of your bed or armchair! The Stalls has an en-suite bathroom. 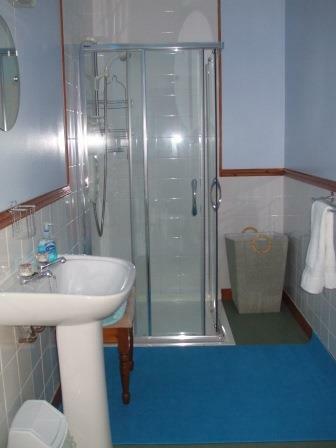 The shower is level access (no steps), so is suitable for those with minor mobility difficulties. There is a radiator in this bathroom, along with a wall heater - so you are sure to always feel comfortable after your nice hot shower.